Tiger beetles (Cicindelinae) are strikingly beautiful predatory insects which come in a bewildering variety of stunning colours: iridescent, metallic greens, reds, blues and so on. Researchers have speculated about the function of these gorgeous colours and have come up with theories to do with crypsis (blending in), disruption by iridescence (dazzle! ), mimicry (trying to look like something else), and thermoregulation (regulating their body temperature). 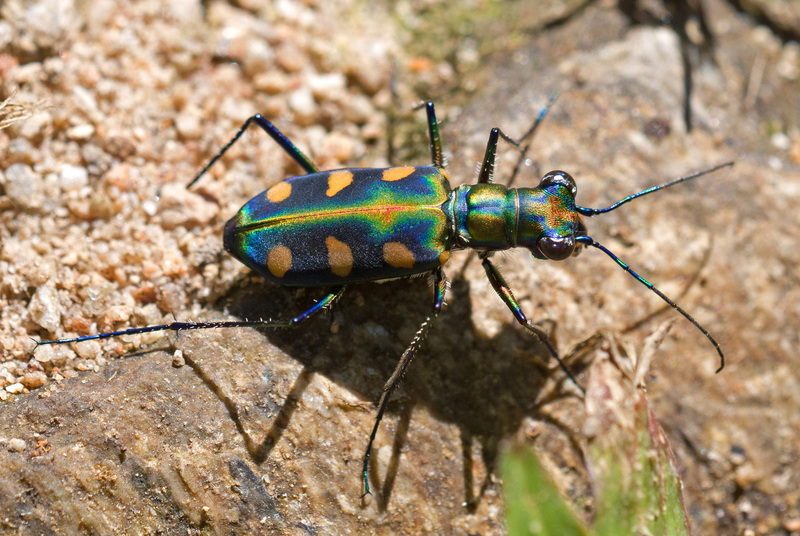 For example, the iridescent colours of some species might be acting as an aposematic or warning coloration; a message to other would be predators that they are highly distasteful (some tiger beetles produce cyanide!) and best avoided! “these ‘pixels’ of bright iridescent colour blend to create a diffuse, matte brown, green or similarly unsaturated hue, often matching the colour of natural backgrounds2 (Seago et al., 2009). Tiger beetles are fast movers, perhaps the fastest of all ground-based insects. For example, although the Australian tiger beetle, Cicindela eburneola, was found to have an absolute speed of only 1.86 m/s (or 4.16 mph), its relative speed was 171 body lengths per second (bl/s). Using speed relative to size, is a much more accurate way of comparing the relative speeds of animals of greatly contrasting dimensions. Using this measure, Usain Bolt, only has a relative speed of about six bl/s (27.3mph), and even a cheetah only manages around 16 bl/s (75 mph). Other researchers have found that tiger beetles move so fast when chasing prey that they effectively go blind! Their brain just cannot keep up! Tiger beetles move fast to catch prey, and they are ferocious predators of a host of other insects, but their sprinting ability may also help them to evade capture from their own predators. 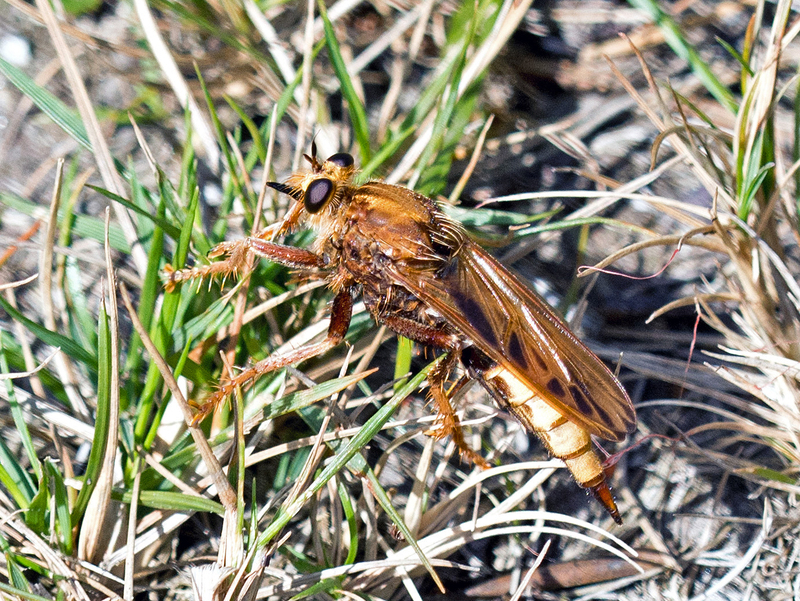 Robber flies are known to prey on tiger beetles. For example, the fearsome looking Hornet robberfly, Asilus crabroniformis (below), feeds on a variety of beetles and flies. Tiger beetles can also fly of course, typically making short flights and landing again; according to tiger beetle expert David L. Pearson, this is how these killer flies catch them, on the wing (Pearson, D. L., & Vogler, A. P. (2001). Here’s a picture of another robber fly with a captured tiger beetle. Hornet robberfly (Asilus crabroniformis) a possible tiger beetle predator. The beautiful Cicindela gloriosa, of a very deep velvety green colour, was only taken upon wet mossy stones in the bed of a mountain stream, where it was with the greatest difficulty detected. A large brown species (C. heros) was found chiefly on dead leaves in forest paths; and one which was never seen except on the wet mud of salt marshes was of a glossy olive so exactly the colour of the mud as only to be distinguished, when the sun shone, by its shadow! Where the sandy beach was coralline and nearly white, I found a very pale Cicindela; wherever it was volcanic and black, a dark species of the same genus was sure to be met with. (Wallace, 1891). This fascination with how tiger beetles seem to match the colour of the substrate (mud, sand etc.) on which they occurred, led one biographer (John van Wyhe, 2013) of A W Wallace to speculate that this may have been the spark – in the same manner as Darwin’s finches – that led him to come up with his own theory of evolution by natural selection. Other Wallace scholars have however, dismissed this idea – that cryptic colouration in tiger beetles led Wallace to natural selection – as ‘doubtful and unsubstantiated‘. 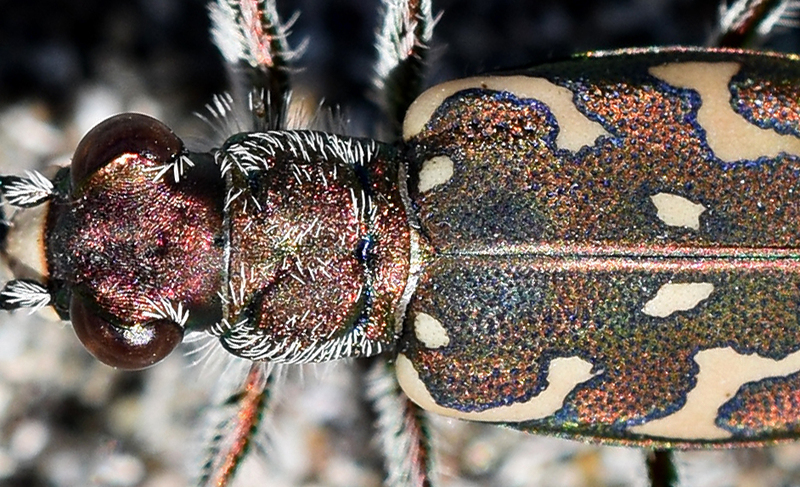 More recently, other researchers have investigated how colour morphs that match different substrates might evolve within tiger beetle species. For example, three different colour morphs of the New Zealand species, Neocicindela perhispida, matched the sand of their respective beach habitats in much the same way that Wallace observed over 130 years beforehand. One subspecies matched black iron sand beaches; another mottled variety occurred on yellowish-brown beaches; and a third white form inhabited white quartz beach sands (Hadley, N. F., Schultz, T. D., & Savill, A. (1988). The parallels with Wallace’s observations are striking. 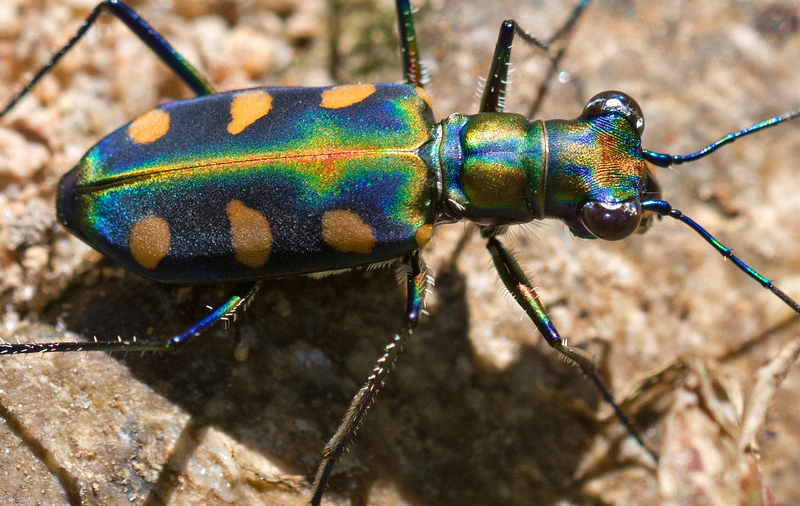 There’s an awful lot more that could be written about tiger beetles. New species continue to be discovered and there are at least 2,800 species worldwide (five in the UK); their bright colours and fascinating behaviour make them interesting subjects for observation and research. I can’t wait to see more of them! Gilbert, C. (1997). Visual control of cursorial prey pursuit by tiger beetles (Cicindelidae). Journal of Comparative Physiology A, 181(3), 217-230. Hadley, N. F., Schultz, T. D., & Savill, A. (1988). 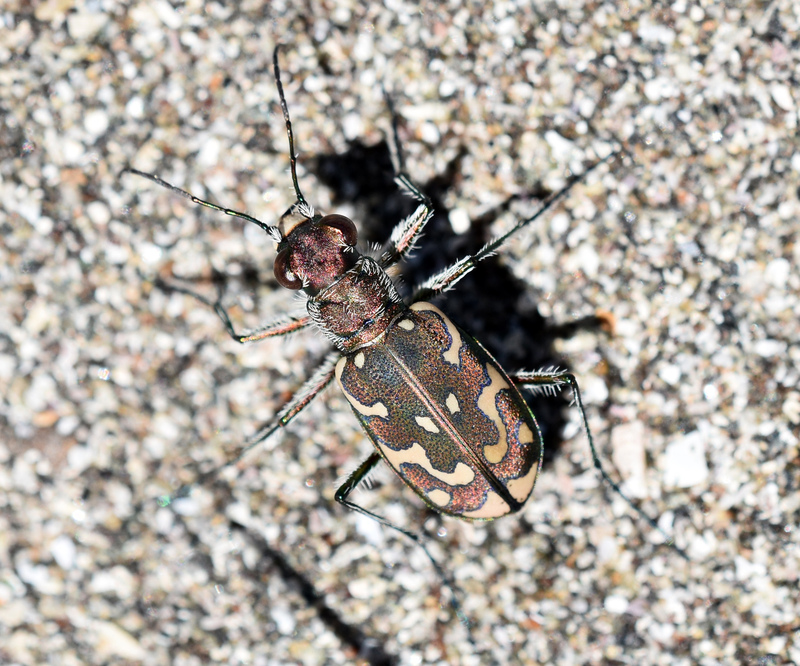 Spectral reflectances of three tiger beetle subspecies (Neocicindela perhispida): correlations with their habitat substrate. New Zealand Journal of Zoology, 15(2), 343-346. Kamoun, S. & S. Hogenhout, S. A. (1996). Flightlessness and rapid terrestrial locomotion in tiger beetles of the Cicindela L. subgenus Rivacindela van Nidek from saline habitats of Australia (Coleoptera: Cicindelidae). Coleopt. Bull. 50: 221-230. Knowles, D. G. South East Asian Beetles Carabidae (Carab Beetles, Ground Beetles, Tiger Beetles). Pearson, D. L., & Vogler, A. P. (2001). Tiger beetles: the evolution, ecology, and diversity of the cicindelids. Cornell University Press. Schultz, T. D., & Rankin, M. A. (1985a). The ultrastructure of the epicuticular interference reflectors of tiger beetles (Cicindela). Journal of Experimental Biology, 117(1), 87-110. Schultz, T. D., & Rankin, M. A. (1985b). Developmental changes in the interference reflectors and colorations of tiger beetles (Cicindela). Journal of experimental biology, 117(1), 111-117. Schultz, T. D. (2001). 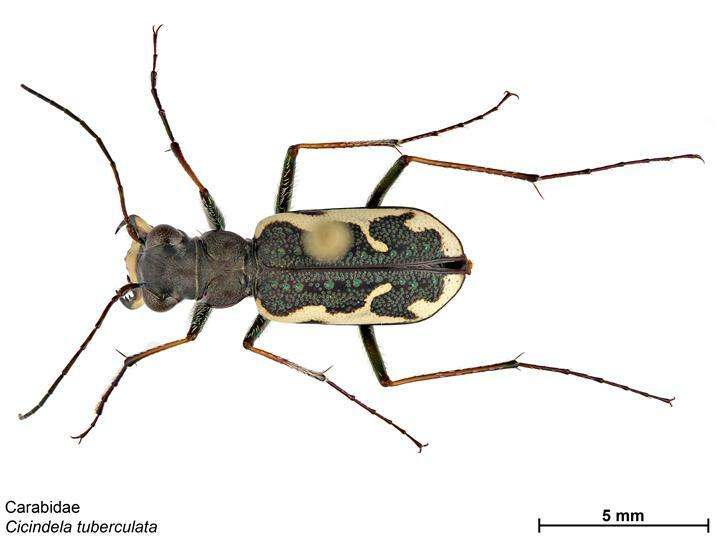 Tiger beetle defenses revisited: alternative defense strategies and colorations of two neotropical tiger beetles, Odontocheila nicaraguensis bates and Pseudoxycheila tarsalis bates (Carabidae: Cicindelinae). The Coleopterists’ Bulletin, 153-163. Seago, A. E., Brady, P., Vigneron, J. P., & Schultz, T. D. (2009). Gold bugs and beyond: a review of iridescence and structural colour mechanisms in beetles (Coleoptera). Journal of the Royal Society Interface, 6(Suppl 2), S165-S184. van Nidek, C. B. (1965). Cicindelidae of New Zealand with descriptions of a new species and subspecies. New Zealand journal of science, 8, 352-358. Wallace, A. R. (1891). Natural selection and tropical nature: essays on descriptive and theoretical biology. Macmillan and Company. Next Next post: Small Pearl-bordered Fritillary: What’s in a spot? However, where does the number 4000 come from? The database carabidae.org currently lists about 2800 species (including subspecies in total 3700 taxa) in the subfamily Cicindelinae.